Matthew is a client portfolio manager within the Advanced Beta Strategies platform of Goldman Sachs Asset Management’s Quantitative Investment Strategies team, focused on the team’s exchange-traded fund (ETF) franchise across smart beta and liquid alternative strategies. Previously, he was global head of Systematic Trading Strategies in the Securities Division. He joined Goldman Sachs as a managing director in London in 2007 and relocated to New York in 2009. 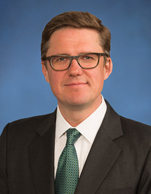 Prior to joining the firm, Matthew was a managing director and commodity strategist at AIG Financial Products in Wilton, Connecticut. Earlier in his career, he was a director and co-head of Commodity Investor Solutions at Barclays Capital, prior to which he was global head of Precious and Base Metals Derivatives Trading at Barclays. Between 1993 and 2000, Matthew worked at AIG Trading Group in a variety of roles, the last of which was trading precious metals forwards and options in London. Matthew earned a degree in history, with high honors, and sociology from Kenyon College in Gambier, Ohio, in 1993.